Woodburytype o Victor Hugo bi Étienne Carjat, 1876. 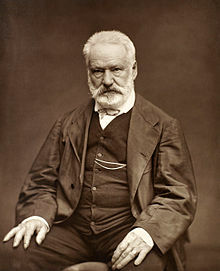 Victor Marie Hugo (French: [viktɔʁ maʁi yɡo] ( listen); 26 Februar 1802 – 22 Mey 1885) wis a French poet, novelist, an dramatist o the Romantic muivement. Hugo is conseedert tae be ane o the greatest an best-kent French writers. Ootside o Fraunce, his maist famous warks are the novelles Les Misérables, 1862, an The Hunchback o Notre-Dame (French: Notre-Dame de Paris), 1831. In Fraunce, Hugo is kent primarily for his poetry collections, sic as Les Contemplations (The Contemplations) an La Légende des siècles (The Legend o the Ages). Hugo wis at the forefront o the romantic leeterar muivement wi his play Cromwell an drama Hernani. Mony o his warks hae inspired muisic, baith in his lifetime an efter his daith, includin the muisicals Notre-Dame de Paris an Les Misérables. He produced mair nor 4,000 drawins in his lifetime, an campaigned for social causes sic as the aboleetion o caipital punishment. Tho a committit ryalist whan he wis young, Hugo's views chynged as the decades passed, an he becam a passionate supporter o republicanism; his wirk titches upon maist o the poleetical an social issues an the airtistic trends o his time. He is buiried in the Panthéon in Paris. His legacy haes been honoured in mony weys, includin his portrait bein placed on French siller. This page wis last eeditit on 17 Mey 2018, at 19:55.